Located in Section 5 (full map of section) along with the Midtown District (see separate entry for Midtown District). 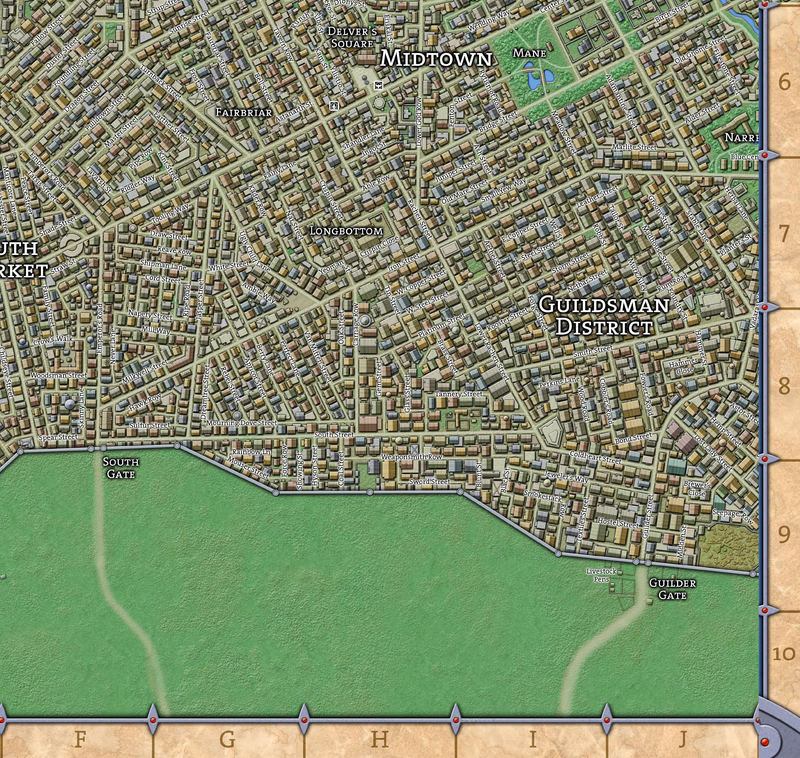 The Guildsman District is a large section of Kokand located in the southeastern portion of the city, bounded by the Cliffs of Lost Wishes to the east, the city wall to the south, Iron Street to the north, and Carriage Row to the west. In this industrial area, ore is smelted, livestock are slaughtered, and artisans ply their trades. As the name of the area itself suggests, the Guildsman District is where most of the members of various local guilds work and spend their time. Most of the low-ranking guild members also live here, though wealthier members move to Midtown or Rivergate, some eventually move to the Nobles’ Quarter. Guild members, virtually without exception, wear badges that display not only their member- ship affiliation but their rank. These badges are a prized possession for many of them—they provide a sense of camaraderie, solidarity, and pride. The guilds encompass low, middle, and high social classes. The folk of the lower class join a guild to learn a trade and benefit from the organization. Skilled, well-trained artisans (as opposed to simple laborers) in any guild earn enough money and respect to make it into the middle class. In a large guild, the craftspeople may not even associate with the laborers, journeymen, and apprentices. Guild leaders are usually very wealthy and influential—so much so that they rarely take part in the trade of the guild. They are purely administrators, advocates, and business owners. No matter what your social rank, however, guilders typically distrust nonguilders in the District, at least a bit. On top of that, however, the various guilds vie for power and maintain a complex set of rivalries; members of one guild may distrust, dislike, or even wish harm upon the members of another. Nonguild laborers and craftsmen in the district are rare, usually because others either run them out of the area or force them to join a guild. The few unaffiliated who do try to work here find themselves treated poorly. The people of the Guildsman District sometimes work in large groups, such as in the Foundry or the Stockyards. Others, however, toil alone in small workshops blowing glass, weaving cloth, braiding rope, fashioning tools, or something similar. These small workshops usually cluster together near related crafters. A visitor would find women stitching gloves in a workshop next to a man crafting leather belts, or see a coppersmithy next to a tinsmithy. The criminal element remains strong in the Guildsman District. Laborers and artisans work long, hard hours; after work they often seek liquor, drugs, and other vices. Gambling dens, brothels, drug parlors, and other shady establishments cater to these needs. Other criminals prey upon the workers here. The problem is so bad, in fact, that many foremen pay their workers daily rather than weekly, so no one ever has to carry a large amount of money at once. This entry was posted in City of Kokand, World Atlas and tagged city of kokand, district, guildsman district. Bookmark the permalink.